Maeve is working herself to death in London, as an interior decorator to the stars (and rich yet undecided) she’s working eighteen hour days on an endless day of putting out fires, organizing deliveries and gently coaxing clients toward the ‘best’ choices for their new décor. But she’s now experiencing panic attacks and sleepless nights, and a weight loss that has alarmed her doctor who prescribed she get away and relax for a few weeks. The past few years have been a never-ending round of work, work and more work. But her recent dreams have brought her to Sandy Cove and Willow House, a favorite childhood hideaway owned by her beloved aunt and uncle. She and her sister Roisin had spent many summers there enjoying the simpler things in life, and now with her uncle having died and she not able to go to the funeral, she’s decided to visit her aunt, Philomena, and regroup and recuperate in the old house. A quick visit with her sister to borrow her car and head west, and Maeve is soon in Willow House – the old place is in need of repair and work, and Aunt Phil has discovered a worrying ‘mystery’ amongst Joe’s things, things she couldn’t face sorting through in the years since his death. 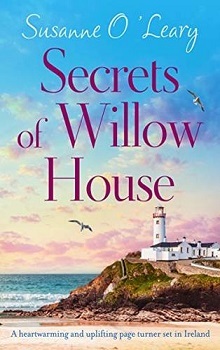 Willow House has provided everything Maeve needs – scenery, beach, memories from her childhood and a quiet place to regroup as she thinks about the ‘new man’ she met before leaving London, and the Irishman that owns the ‘bookshop’ who stirs her interest and feels ‘familiar’, as well as intriguing. From digging through Joe’s laptop to discovering his real “secret’ that could be the saving of Willow House and all of the repairs it needs, she’s also been coming to grips with Phil’s alone-ness and her own desires to stay in Sandy Cove. Maeve is also finding herself fitting right back in to the way of life at Sandy Cove: swimming, quiet walks to town, reading with Phil to the old ladies in the “communal house’ they occupy, even nights in the pub or stargazing all bring her a sense of peace and home that was missing in London. But, not the most daring of creatures, Maeve is, despite her not wanting to, planning her return to London and the rat-race. Oh this was a lovely story: with Maeve coming up on forty and finding that what she dreamed of as a young girl – designing and decorating – isn’t quite the ‘lark’ she thought it would be, and her boss, with her inability to say ‘no’ to a job, the boss’ increased deterioration of mood, vacillating and overly demanding clients and the expectations that none of her time is her own, have her dreaming of the day when things are different. And, with the push, the opportunity and a promise of something more with the boy who kissed her and disappeared when she was 15, never to be forgotten – she’s taking the chance to start anew in Sandy Cove. A lovely vacation read with plenty of heart and opportunity, choices and chances, and lots of laughter and healing make this a book that is hard to put down and harder to forget. Grab this for an escape into places that everyone wants: timeless, accepting and supportive, with heart, laughter and love sure to put a smile on your face. That does sound like a lovely escape by book.